Please take a look at your PHP error log and your MySQL error log. This is my php error log created via .htaccess. It's a shared host I don't have access to the real logs. I don't think we can do much here. Looks like some DB issue to me. Has this happened before? For how long have you been using Matomo? Did it happen with 3.8.0? Error in Matomo: Zend_Session is currently marked as read-only. There weren't any errors before version 3.8. 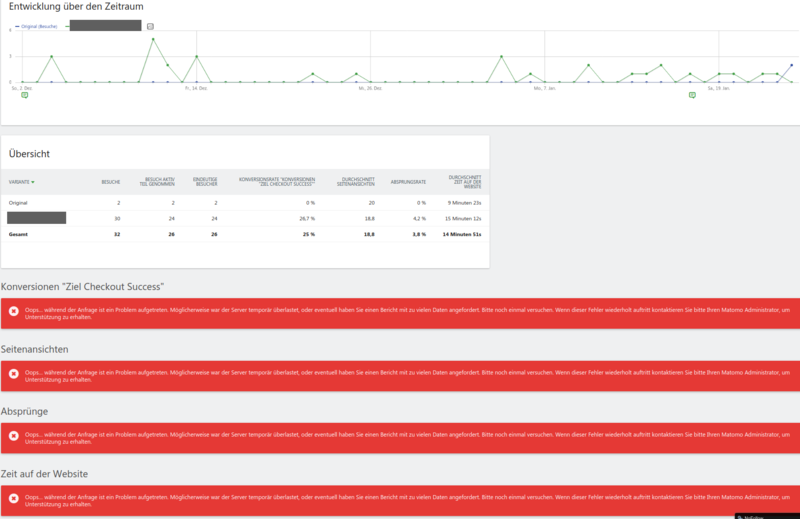 I noticed the errors yesterday, because there were some Ooops warnings in the front end and I took a look in the logs. After the update to 3.8.1-b1 the Ooops warnings popped up two or three times again. Then I deleted all tmp files in the matomo directory and the Ooops warnings are gone now, but the errors in the php error log are still rising. Last one from 23-Jan-2019 17:40:04, German timezone. @diosmosis do you maybe have any ideas? not sure how this could happen and whether it is related to us. Wondering if it's due to changing the Dbtable session adapter or some general session work. I reckon maybe the Error in Matomo: Zend_Session is currently marked as read-only. errors are unrelated. Not sure. @tsteur found this comment in another project: https://github.com/walkor/Workerman/issues/357#issuecomment-416863614 seems to suggest the problem occurs because something closes the connection and then php tries to close it itself. Possibly done at the end of a request? @robles-design might be helpful to contact the web host in this case, though it is strange it would start happening after an update. Ok, the good news: no new errors in the php error log since yesterday. Last one was Error in Matomo: Zend_Session is currently marked as read-only. The bad news: it all starts again. Maybe it's related with the A/B-testing plugin, because the Oops warnings popped up first in one of the A/B tests, is there again and stays there even after a reload (see screenshot from today). It displays new entries in the overview. After a reload the admin messages are gone. No more errors in the php error log since 23-Jan-2019, but the A/B-testing plugin doesn't work (see last post). Any ideas? Update: Since yesterday the A/B-testing plugin is working again, no more Oops warnings, nothing changed. Today I've updated to Matomo 3.8.1 and all works fine. Thanks for your support. You can close this ticket now. Awesome glad it works now 👍 feel free to contact us directly through shop at innocraft.com if you otherwise experience any trouble re a/b testing.